Athlete Web Design Experts Needed? At Ad Army Group Marketing services recognize that an athlete’s website should not use regular corporate or personal website themes. They need a special marketing strategy and an athlete web design that can showcase their lives and achievements for their fans to refer to. This type of website helps them book engagements for autograph appearances, public speaking, and endorsements. An athlete who is still engaged in their sport or who has retired and is looking for corporate engagements needs an athlete web design to represent their career. By working with numerous athletes in different sports and at different stages in their careers, we understand just how important a well-designed athlete web design is to put them on the map. Consequently, our websites are designed to provide fans an insight into their exciting past and future goals. A well-organized, well-thought out athlete web design is necessary to display a professional athletes accomplishments in their sport. It is also necessary to help share information about their civic contributions. For instance, an athlete may be dedicated to a particular charity and have contributed considerable time, money, and effort to promoting its cause. The home page may features a collage of the athletes career, highlighting peak moments in their sport. It’s important to have an exciting page that immediately captures a visitor’s attention, stirring memories of the athlete’s finest moments. The collage may include an action shot during a game, perhaps showing a winning shot or a touchdown or reaching the finish line. It may include pictures of the athlete in training, perhaps running through an icy landscape or doing limbering up exercises on a summer’s day or bench pressing in a gym. It may include pictures of the athlete receiving an Olympic gold medal or holding a team trophy or receiving a gigantic check to donate to a favourite charity. In addition to the images on the home page, slideshows on other pages might further reinforce this dynamic representation with images of major moments in their exciting career. Furthermore, our web athlete web design company might also include charity events, logos, and other prominent symbols of achievement along with the slideshow. We believe accentuating the peak moments in an athlete’s career through great photographs and vivid descriptions is a powerful way to unify past achievements with present contributions. As a result, our websites may have several pages that outline an athlete’s entire career, describing through images and words how they became legendary in their sport. The about page will usually summarize in crisp short bullets the athlete’s entire story, as well as chronologically list former and current accomplishments. We have also found, through market tests, that a photographic time-line accomplishing the biography helps fans get a better glimpse of their favorite athlete’s triumphs. And, of course, another important element for fans are an athlete’s stats. Still, it’s not all about athletics. We also recognize that a professional athlete's career is not only about athletics but should also mention family, business, formative experiences growing up, influential people, and contributions to society. Fans are not only interested in what athletes did and how they did it, but also how they live and what ordinary things they do. For this reason, there will be another section of the website dedicated to the athlete’s life, mentioning their speaking tours, introducing their family, or discussing their life after retirement. Emphasizing the personal side of an athlete’s life is necessary to complete the story. Finally, we will include a way people can reach out and contact the athlete for booking information. After reading about an athlete’s incredible accomplishments, fundraisers are often eager to have them speak at their events, corporate executives are often eager to hire them as motivational speaker, and educators are often eager for them to share their story of discipline, courage, grit, and determination with young people. Athletes focus on training for years with unflagging zeal to create outstanding, sometimes unprecedented, results. Similarly, our websites are geared to providing results for them. After all, an important factor in hiring an expert team of website designers who use marketing principles is to keep the phone ringing. Our unique website athlete web design, with the right images, well-designed graphics and perfect descriptions, provide a way for athletes to showcase their achievements and share their personal lifestyles and future ambitions. These captivating websites also encourage visitors to book the athlete. In addition, these websites serve as engaging platforms for social media sharing. Thus, besides a great looking website, we set advertising strategies into motion for our clients so that they can enjoy a continual steam of business. Our company has extensive experience with more than just creating an Internet presence; we also help our clients engage with their target audience in numerous ways to expand their business and their careers. So it’s not just about a website, it’s also about effective marketing, promotion, and advertising. Paul Cookson is a marketing expert who has been helping companies and people succeed with their business for more than twenty years. Ad Army Group, his ad agency in Toronto, as well as it’s web division, Ace Web Design, have helped businesses with customized web design, video production, and marketing, advertising, and promotion. Paul Cookson has helped startups develop plans for marketing and sales, as well as struggling companies begin to prosper with new marketing and advertising strategies. His team have helped companies like RE/MAX, CVS Drugs, Canadian Tire, Toyota and Toshiba with beautiful websites and effective marketing plans. Additionally, his team has also helped a large number of famous athletes with websites and marketing strategies. 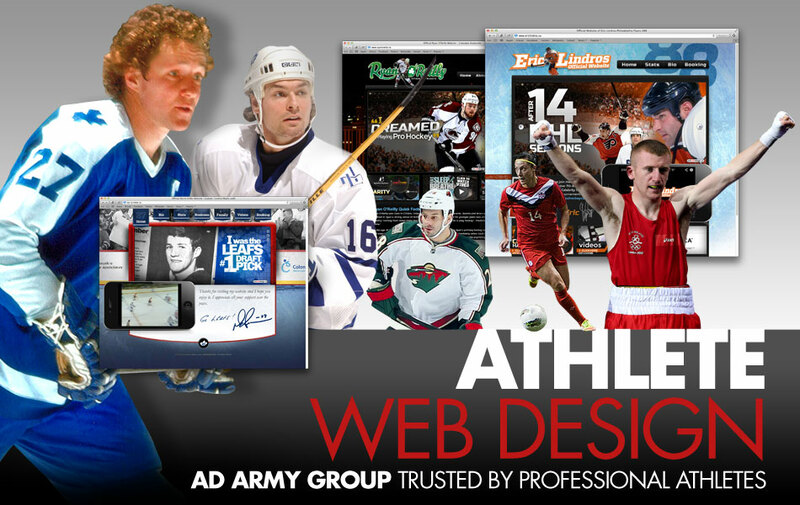 Numerous top professional athletes have benefited from our athlete web designs, including Darryl Sittler, Eric Lindros, Darcy Tucker, Zenon Konopka, Ryan O'Reilly, Paddy Barnes, Darcy Marquardt, Rachelle Viinberg, and Melissa Tancredi. 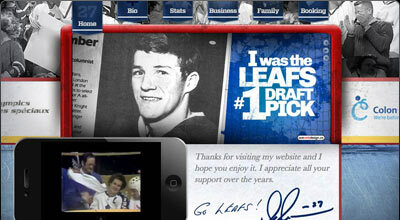 The athlete web design we built for NHL Darryl Sittler--who in 1989 was elected to the Hall of Fame—shares his journey from a pro hockey player for the National Hockey League to a public figure. As a public figure, he enjoys family life, signing autographs, does speaking engagements and help in raising funds for charities. 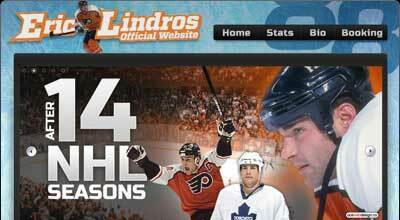 The athlete web design we built for Eric Lindros uses visuals that almost make viewers feel as if they are part of the International hockey scene, ready to score a goal with a quick assist from Eric. Videos highlight his peak moments with the NHL and photographs of his early youth reinforce his image of a natural athlete. His website delights fans with a glimpse into his personal life and professional career. It’s easy to navigate his website, review his bio, and find his booking information. The athlete web design we built for Darcy Tucker shares career highlights when he played for a number of teams in the National Hockey League, including the Toronto Maple Leafs. It provides all his key statistics, like his 1410 penalty minutes, 215 goals, 261 assists, 947 regular games, and 68 games. Finally, it gives visitors an idea of his life after he retired in 2010, and how, with his long-time friend and former agent, Carlos Sosa, he is now making Turning Points Sports Management into a powerful sports agency. 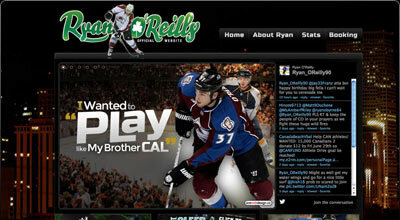 The athlete web design we built for Ryan O’Reilly, a professional hockey player, covers all the remarkable things he did in his stellar career. The videos are engaging and bring out the athlete’s personality and natural sense of style. The about page is replete with awe-inspiring stats and it is easy to figure out how to book him for special guest appearances. 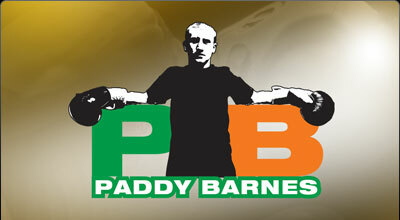 The athlete web design we built for Paddy Barnes, an Irish amateur boxer who has won 6 medals, shares his light flyweight career with his fans. The website goes over his career history, covers his statistics in great detail, and shares fascinating biographical information about the man, his passion for boxing, and his irrepressible personality. His blog page reveals his experiences as they unfold and tips his fans off about where he will be fighting next as he travels around the world to engage in different boxing tournaments. 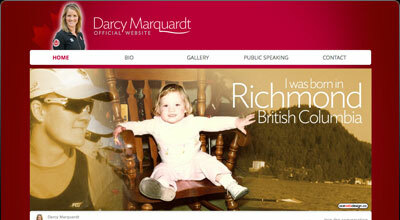 The athlete web design we built for Darcy Marquardt, a Canadian rower, shares a lot about her personal life. It offers a glimpse into her family of origin and her current family life. It highlights the time time she won the silver rowing medal during the 2012 London Olympics. Finally, it ties together how all her diverse experience in other sports like gymnastics, floor hockey, figure skating, softball, rugby, and volleyball helped become an elite level athlete and a successful business person. 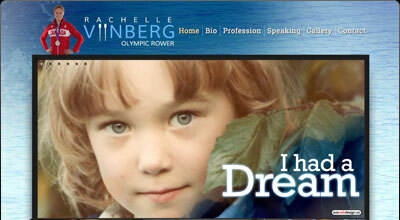 The athlete web design we built for Rachelle Viinberg, also a Canadian rower, gives visitors a very clear idea about her remarkable life as an athlete and a doctor. Visitors learn how she managed to participate in three Olympic games as a rower, including winning a silver medal in the 2012 London Olympics. They also learn how, on top of these athletic achievements, she went on to become a doctor of Naturopathy from the Canadian College of Naturopathic Medicine. Besides the numerous pictures that tell her story, the tight narrative prose brings to life, the many challenges she overcame in her life. 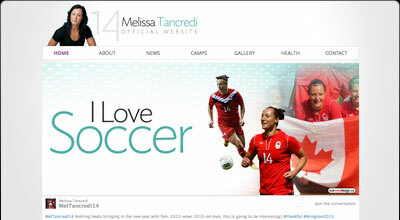 The athlete web design we built for Melissa Tancredi highlights how she is an accomplished soccer player. As visitors go through the highlights of her life and career, it will give them a good idea about how her disciplined nature helped her to do so well at soccer in the Olympics. Besides describing her mastery of all things soccer, the website also shares a glimpse of her as a community leader and talented public speaker. Many web design companies who simply build sites with an eye for aesthetics are oblivious of marketing and what it takes to bring in a steady stream of clients. With our company things are refreshingly different. While we do build engaging, attractive websites, we also make sure that there are enough "call to action" messages embedded in strategic places throughout the website to make the phone ring. Our websites and our business are built to satisfy the marketing needs of today’s consumers, who tend to use the Internet more than any other media when they are looking for information. After you browse through our portfolio, you will understand why many of today’s top athletes trust us to showcase their brand, so if you are a pro athlete or an agent of one and you would like to have a website that works, pick up the phone and call us at 416-286-2860 to contact marketing expert Paul Cookson for a free, no-obligation consultation. Are you a celebrity athlete who needs more exposure? AdArmyGroup is an expert in Toronto athlete website design and can help you gain the visibility you need to gain more sponsorship opportunities and appearances. You may not be aware of the importance of athlete website design, but it can help your audience remain connected and informed. An involved fan-base is more likely to buy whatever you're promoting, and this means more revenue and profits for you and your sponsor. Does it sound good so far? We hope so! There is so much to gain from a well-designed website. Sponsors can view, at a glance, what you're about in your personal and professional life. If they like what they see, they'll sponsor you. It's as simple as that! We can help make you more appealing to sponsors and your target audience to help you land more appearances and sponsorships, but you have to take the first step and look at what we have to offer. Here's what you should know if you're a celebrity and considering Toronto athlete website design. What is Toronto Athlete Website Design and Why is it Important? Toronto athlete website design bases its layout on principles that will appeal to athletes and celebrities. The main goal of athlete website design is to promote athletes and celebrities in a way that will be compel others to buy products and services. AdArmyGroup has been using these principles and has become proficient in Toronto athlete website design. Athletes are some of the greatest sales people. People look up to athletes and want people to learn more about the products they are promoting. They need an athlete website design expert who can promote them as a professional and give them a good image. Toronto athlete website design is growing in popularity for this reason. It's not all about the sport. It's about maintaining an image and getting people to love the celebrity and the product. We do this well, and that's why we're showing you our products and services to determine if we can help you become more visible and prominent in your professional career. How many times have you taken a second look at a product just because a celebrity promoted it? Probably more than you think. Michael Jordan was one of the kings of product promotion. He promoted Hanes, Nike, Michael Jordan sneakers, Wheaties, and countless other products. He needed a professional who could deliver an impressive athlete website design even though his performance on the court spoke mounds for his influence in the NBA community. Until Tiger Woods' personal woes, he sold millions for Nike. When his personal image declined, so did his ability to convince the public to buy his products or services. Developing an athlete website design that accurately portrays the celebrities image in a way that would encourage them to buy is a powerful tool. Most people are not aware of the impact a well thought out Toronto athlete website design can make on an audience. It's amazing! Crisp and clear images that are easy to load and that are visually appealing can help people sell the most products and services. As an athlete developing a website, it is important to have a marketing strategy to gain more visibility for yourself and your product. The first step is to ensure that people love you, your sport, and your image. The second step is to position your product to ensure that it appeals to the public. If the first step is in tact, the second step will be easy. Imagine how many tickets Disney sold after every Superbowl game, when the Most Valuable Player announces, "I'm going to Disney World!" Everyone wants to be at Disney World for the parade after the Superbowl. It's a treat to see the MVP riding on a car going down Disney's streets. As a promoter of an athlete, you should keep all of this in mind when you are developing your advertising and marketing strategy. Determine how you can create a marketing plan as effective as Walt Disney World's Superbowl MVP announcing, "I'm going to Disney World." A Superbowl event gives a company maximum exposure, and this is why major enterprises pay so much for commercial time. Companies know that celebrities sell products because they have a huge following. You just need to ensure that your image conveys what America wants to see, and this is where AdArmyGroup comes into play. If you are a celebrity, you must ensure that your image is worthy enough to sell a product or service. An image consultant can help in this capacity. They will survey your target audience and determine what they like. If you're a good fit for the target audience, you're likely to be chosen for promotional ads, but sponsors are less likely to choose you if your athlete website design is not stellar. This is why your athlete website design is important. You should communicate who you are in your profession, in the community, and in other endeavors in your life. If you're a model, actor, actress, or entrepreneur, in addition to being an athlete, you should communicate this on your website. If you've written a book, you can share this also. Share your stats and any awards that you've won. If you've overcome adversity before reaching celebrity status, share this also. Communicate anything that will help you relate with an audience. A marketing consultant can help you gain the visibility necessary to encourage people to buy products or services. Even if you have exceptional Toronto athlete website design, a website that no one is viewing will not accomplish your goals. You will need search engine optimization, social media, and pay-per-click advertising to help you generate traffic online. As a part of your Toronto marketing plan or marketing strategy, a marketing consultant may suggest a promotional giveaway, a television or radio commercial, or print ads to drive more traffic to the website. They will devise a strategy that will be most effective to accomplish your goal. Check the credentials of your Toronto marketing consultant to ensure that he or she can generate the traffic necessary to build the clientele you're seeking. Athlete website design is not an easy task. You must verify that the company you choose has experience, which can be confirmed through their athlete website design portfolio. Links or images of the websites will suffice to demonstrate that they are capable of producing an athlete website design that appeals to the general public. AdArmyGroup is proficient in creating professional athlete website design and has numerous years of experience. They meet all of the criteria and strive to produce a quality website. They also have the evidence to prove that they can produce celebrity websites. Look at some of their examples to learn what AdArmyGroup can do for your company. AdArmyGroup has created some exceptional athlete website designs for celebrities under the leadership of Paul Cookson marketing expert using the exact concepts and principles mentioned above. This company has represented talent such as: Grant Fuhr, Darryl Sittler, Darcy Tucker, Curtis Joseph, Jayna Hefford, Caroline Ouelette, and Rebecca Johnston. The company uses vivid colors, exceptional copy, and high resolution photographs to entice visitors to stay on the page their using. Verbiage like "Official Website of Bill Buckner" is often used to establish authority. 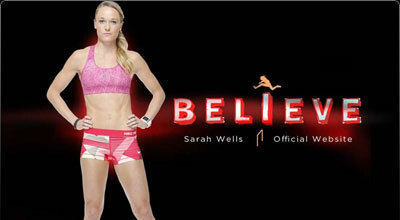 This athlete website design incorporates and displays the athletes in their uniforms and in action in their sport. The designers think about what the fans want to see and know, and they add it to the website. The copy may include the player's biography, statistics, photographs, and blogs about their latest appearances. This helps the audience remain connected to celebrity. When they feel involved and informed about the celebrity's life, they are more likely to buy the products and services they are promoting. AdArmyGroup meets all of the criteria that an advertising or marketing consultant should. They have established their company as an authority in the field and can bring celebrities the exposure they need to remain in the public sphere and gain more clients. Contact the AdArmyGroup for a free, no obligation consultation. We are a leader in Toronto athlete website design and can help to propel any athlete to the forefront to get more visibility and sponsorship. Sponsorship can help athletes improve their image and also to help them earn a larger income. If you want to learn more about Paul Cookson marketing expert, navigate to www.paulcookson.com for more information. He is one of the best in the industry and can help you with an athlete website design that delivers results. Don't procrastinate, let's get started today by call Paul Cookson at 416-286-2860.